1. What is tungsten ring? 6. How to care tungsten rings? It comes from the Swedish tung sten, which means "heavy stone". Tungsten's chemical symbol comes from its early Germanic name Wolfram. Wolfram means “the devourer of tin” because minerals can interfere with the smelting of tin. Pure tungsten is a light gray or white metal that is soft enough to be cut or extruded into various shapes with cracks and sufficient toughness. If contaminated with other materials, tungsten becomes brittle and difficult to use. Tungsten has the highest melting point of all metal elements and will melt at very high temperatures. When tungsten is mixed with carbon, the resulting compound is referred to as tungsten carbide. This material is more durable than tungsten. Tungsten carbide is an extremely hard tungsten compound. Tungsten is 10 times harder than 18K gold, 5 times harder than tool steel and 4 times harder than titanium. It is also very dense, and the jewelry made from it feels very heavy. The tungsten ring is made of two different combinations of tungsten and carbide for the special type of tungsten bracelet. Tungsten carbide has a very high hardness and is twice as rigid. These types of bands cannot be made from a single metal like a gold wedding ring. Tungsten rings require more materials such as carbon and other elements. The combination of metals in the alloy makes tungsten carbide so durable and has a lustrous and expensive appearance. Although tungsten itself is a strong metal, combining it with other metals helps maximize its positive characteristics and produces a variety of tungsten rings, making it ideal for any production. As a new member of the jewelry industry, tungsten carbide has become the metal of choice for use in the ring due to its excellent scratch resistance. The tungsten carbide ring is the only ring that retains its brilliant luster throughout its life cycle. The biggest and most important difference between them is that tungsten refers to a single metal, and tungsten carbide is an alloy of tungsten, mainly carbon. The terms tungsten and tungsten carbide are often used interchangeably. For the sake of simplicity, most premium tungsten carbide ring sellers list them as tungsten rings. The reason for this is that tungsten, which is an independent metal, is actually difficult to construct into a ring. Although 100% tungsten rings are strong, they are not as durable as tungsten carbide substitutes. Tungsten rings in findurings.com are made of tungsten carbide. Our tungsten rings are not made of 100% pure tungsten because they essentially become powders without carbon to alloy. Like other jewelry suppliers, when we mean "tungsten carbide," we just write "tungsten." Many people think that tungsten and titanium are very similar metals, but in reality they are actually very different. If you have a tungsten ring and a titanium ring in your hand, the first thing to notice is the weight. Titanium is very light. It feels like the rings are made of plastic, and many people don't believe they are holding metal objects. On the other hand, tungsten is a very dense metal. 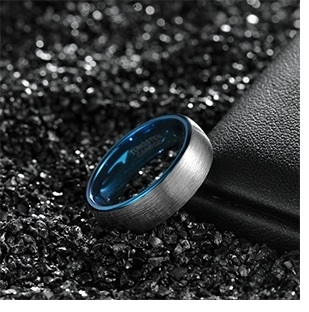 Tungsten carbide has the same luxurious weight as a precious metal ring such as platinum. When you wear a tungsten ring, you feel like you are wearing a gold ring. Many people prefer the weight and weight of tungsten because they feel that their wedding ring should be strong and heavy. Another difference is that tungsten is very hard, so the tungsten ring is difficult to scratch. In fact, it is the hardest metal on earth, and only non-metals such as diamonds are harder than tungsten. The hardness of titanium is about 4 times lower than that of tungsten. Scratching the titanium ring is very easy. One disadvantage of tungsten being so hard is that the metal does not bend. If sufficient force is applied, the ring will crack or break, and the titanium will bend and deform. Titanium cannot be polished to the same high-gloss mirror finish as tungsten carbide, but tungsten can also be used in many other less glossy forms, such as satin, brushed or matte finishes, which are popular in tungsten metal style. The tungsten ring has a very good gloss and has the same brightness as platinum. If you use a tungsten ring, it will remain polished for a long time and will not lose its luster as time goes by like gold or silver. Tungsten rings are much heavier than stainless steel and titanium rings. The tungsten ring is made of tungsten carbide, which is a compound containing an equal amount of tungsten and carbon atoms. Tungsten carbide is so strong that there is only one other material on this planet that is stronger than tungsten carbide and is a diamond. Therefore, tungsten wedding rings are very durable. Tungsten carbide is the most scratch-resistant metal known to man. Tungsten wedding rings are highly resistant to rust and cannot be effectively scratched. Under normal conditions, it is difficult to form dents or gaps in the tungsten carbide ring. They do not need to be polished often to prevent them from being scratched. Due to its hardness, tungsten does not bend and deform, so in the event of an accident, the ring will deform without damaging the fingers. In emergency medical situations, the tungsten ring can be quickly and easily removed from the finger. Tungsten carbide does not cause an allergic reaction when worn. Although tungsten carbide used in jewelry typically contains some nickel, this metal usually constitutes a small fraction of the final mixture. It is hypoallergenic. Those who are allergic to gold jewelry can wear tungsten jewelry. Men's wedding rings are limited. They are made only of gold, silver, and are always flat. The softness of these two metals limits their style design. Tungsten carbide is very hard. Therefore, it can twist, rotate, roll up and withstand various forces to give it a customized look. They are very versatile in terms of styling. On the other hand, tungsten wedding rings are made of natural metallic grey, but can be black, white or even gold. It offers a variety of finishes, including highly polished mirrors and dark grey brushed faces. Tungsten carbide jewelry is affordable. Tungsten carbide rings are clearly the most cost-effective compared to other metal rings. It will save you a big budget. Like a diamond, tungsten has a strong scratch resistance and does not bend and deform, but it will break if enough impact or pressure is applied. Findurings will offer a lifetime warranty that covers this by providing a replacement ring in case of accidental breakage. Tungsten carbide’s durability comes at a price. Due to the high hardness of the tungsten ring, it cannot be resized. That's why you should carefully choose your size to make sure your new ring size is right. We provide a lifetime sizing policy to provide for size exchanges when your finger size changes. Tungsten carbide does not easily change back to cash. Gold has liquidity in the world commodity market and it is not easy to be devalued. This means that turning gold into cash will be easier. If you don't like your ring one day, tungsten will not be traded and it will be difficult to value. HOW TO CARE TUNGSTEN RINGS? If your tungsten carbide jewelry is dirty, clean the surface of the tungsten ring with a soft cloth dampened with a mild soap solution. Thanks to its high elasticity and scratch resistance, you can carry out this simple cleaning without having to worry about any damaged rings. Use a few drops of mild hand sanitizer or dish in a bowl of warm water and soak the dirty jewelry inside for a few minutes. In most cases, when the jewelry is immersed, all dirt will be lifted. If any dirt persists, wipe it gently with a polishing cloth and then dry the jewelry. First, we can make our own tungsten jewelry cleaning solution by simply mixing warm water with a few drops of mild soap. Hand sanitizers and mild dishwashing detergents are a good choice. After preparing the cleaning solution, create a lather using a cotton cloth. Wipe the outside of the tungsten ring with a cloth and scrub with force to remove dirt. You can then use a cotton swab or toothbrush to clean any grooves or gems and other ring components around. If you have a very complicated tungsten ring, you can soak the ring directly into the solution to loosen the dirt. When you think the ring is clean enough, rinse it in warm water. Wipe dry with a clean cotton cloth. Remember to avoid the use of ultrasonic cleaners, steam cleaners or irritating chemicals that can cause spots on the ring surface. Any other types of cleaning solutions or lotions can damage tungsten by reacting poorly with its composition. Alcohol hand sanitizer and dirt can leave buildup on your ring, which can make your ring look darker. When this happens, simply clean all the tungsten rings as described above and wipe the surface thoroughly. You will find your ring shining like the new one.